The efficient organization of a team is a vital point for the success of every major project. As the most of us study at the trinational school ESBS we communicated between several different countries in three languages (English, French and German). In order to distribute tasks, solving problems and scheduling the work, achievements and the things to do we used two different software which help us in this process. 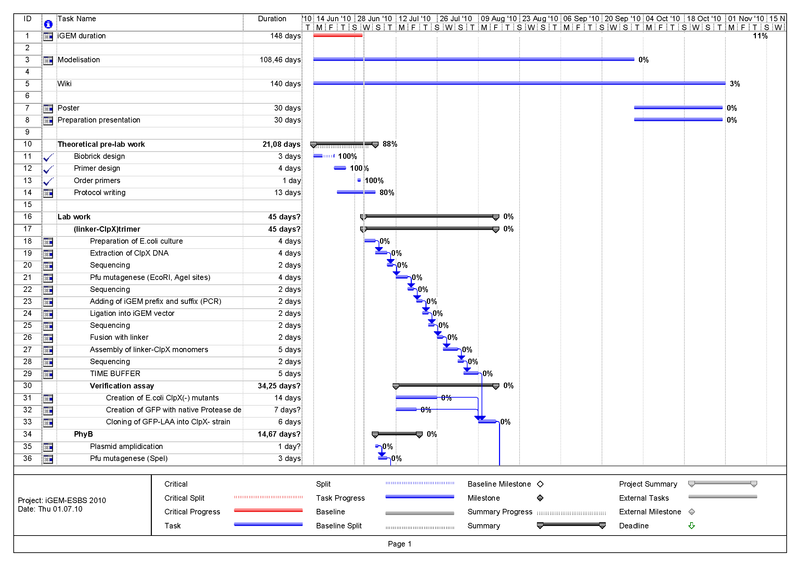 OpenProj is a free open source management program. It has similar functions like Microsoft Project and was used especially in the beginning of our project to plan the upcoming tasks. Each task can be given a certain start date and duration of days. Several tasks can be interconnected together to form a sequential order. This program is extremely useful when planning what/how be done at what time and also it is a reminder when certain tasks should be finished. These tasks can be projected in several different ways. The first picture shows the global time schedule we had created in the end of June. 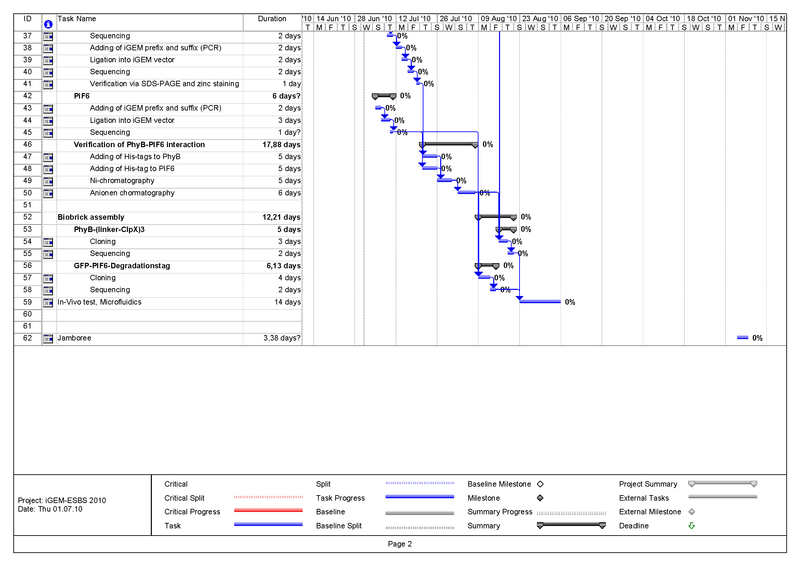 The second picture is the projection of the same schedule as a flow chart. Zoho was used as a communication platform. It includes a calendar, an organizer and forum where all main tasks can be discussed. It was useful to organize the work not just in discussion but also in written forms which were accessible for all team members even when they were not able to participate in certain meetings. On the occasion of the “International Genetically Engineered Machine” competition, the ESBS Strasbourg team conducted a survey to assess the opinion of people at large on synthetic biology compared to those of the scientific community. The survey was realized on 123 people between 15 and 85 years either by interviewing them or through an internet survey. Our goal was to collect their opinion on different current subjects linked to synthetic biology (GMO, bioterrorism, health and environment). 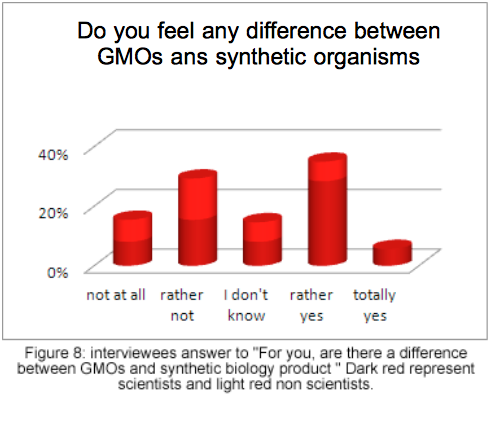 Overall, people met difficulties to define synthetic biology even among the scientific community. General public seem not enough informed about synthetic biology, which often leads them to wary of it. The importance of the applications was highlighted in both groups. General public majoritary fear commercialization and massive use of this technology as it is the case for GMOs in agriculture. Apart from people who directly reject synthetic biology as a technology producing unnatural organisms, the general public is more confident even hopeful when it comes to the possibilities for medical research. Some people also laid the emphasis of the need of having regulation. Synthetic biology is an emerging field consisting in creating new biological functions or even new organisms. This is made through “biobricks. They are standard DNA parts, sequenced which share common interface and can be easily assembled with other biobricks or added into the genome of an organism. Synthetic biology obvious revives ethical and moral debates as a science based on genetic engineering methods. Besides, the groundbreaking characteristic of synthetic biology poses further questions insofar as no return is available yet. Nevertheless, synthetic biology is regarded as a very promising field by some experts. It would enable to solve current worldwide issues such as starvation or discovery of new treatments. Our aim is comparing the point of view of the whole scientific community (not only experts) with those of the general public about synthetic biology. The survey was created to be accessible to everyone including people with no scientific skills. 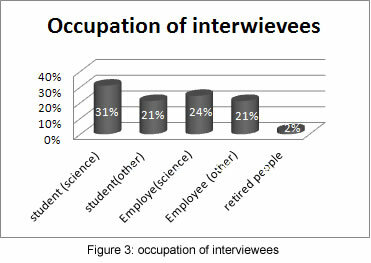 It was composed of 18 questions among which four gathered information on the gender of interviewees, their age, their occupation and their nationality. Indeed, we were also interested in determining the influence of these parameters on their opinion. The questions mainly focused on the trust on synthetic biology, on the link people made between synthetic biology and OGM, between, synthetic biology and bioterrorism and the possible risks triggered by synthetic biology. Five choices (totally against, rather against, I don’t know, rather for, totally for) were put forward. People also have the possibility of letting a commentary, which was strongly encouraged. The survey was realized by interviewing people in the center of Strasbourg or in the campus and on the survey monkey web site. In whole 123 people filled in the survey. 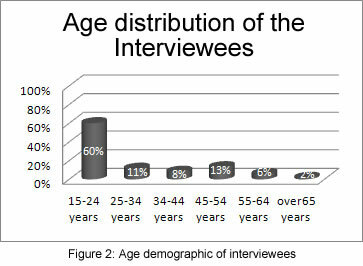 The interviewees split up into a large panel of age even if 15-24 year-old-people are majoritary as illustrated by Figure 2. As our goal consisted in comparing the point of view of the general public with those of the scientific community, we tried to have as many people in each group. This condition has been relatively well fulfilled as referring to Figure 3. 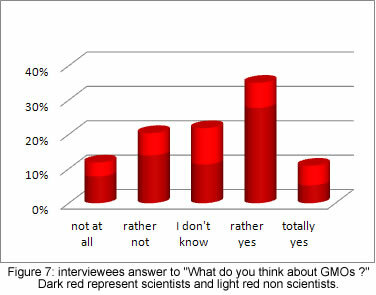 The scientific group will be shown in dark red in the followed graphs (other in light red). Our survey was done mainly on French people (data not shown) and both gender are quite equally represented (see Figure 1). 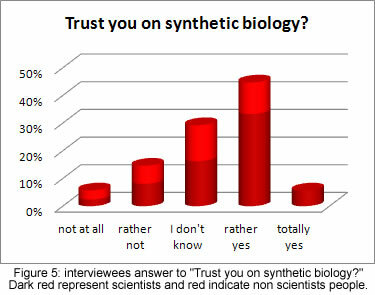 To which extent is Synthetic Biology known and trust ? 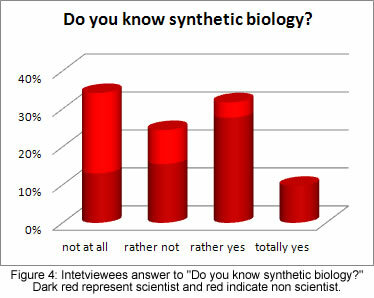 As we can see in graph 4, synthetic biology is not very known by people at large. Obviously, people who worked in the scientific domain are better informed. Nevertheless, even among scientists, the definition of synthetic biology is not obvious. The opinion of each category is ambivalent. Most of people are confident but some fears persist. The non-scientific group have actually mixed feeling: the possibility of creating things that do not exist in nature is terrifying for some people whereas it sounds exciting for other. In their remarks, people lay the emphasis on the importance of the application : “all depend on what we do with synthetic biology”. This point is quite recurrent in this survey. We can notice that people fear the possible abuses, particularly due to economic interests. Thus, they declare themselves in favor of regulation. When the aim is creating new medicines, people majoritary trust synthetic biology. However, the answer to the following question seem disproving this. 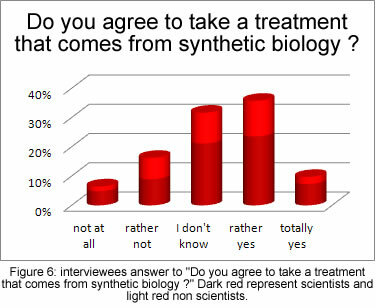 The graph 6 shows that 46% of interviewees will agree to take a treatment which comes from synthetic biology. However, they precise that it would be “the treatment of the last chance”, which seems quite paradoxical as these people claim trusting synthetic biology. The unknown long-term effects of these products and their unknown probably explained this statement. Opinions on this topic are divided. People immediately think about transgenic plants. Ones defend their key role face to starvation problem and globalization. Others blame them for the long term consequences, notably the possible health hazards. Others see GMO as a way for industries like Monsanto to earn more and more money by selling these products to poor countries. Researches lead in laboratories are globally well perceived by people. Furthermore GMOs used to create new drug seem to be accepted by the majority. But this application is most of time unknown by the general public. This question is clearly difficult when people do not know well biology. This explains the result of this study. Scientists have a better idea of the difference between GMOs and synthetic biology product. GMO are organisms with a modified genome. This modification may be an addition or a deletion of one or more gene, like for example a resistance to an antibiotic. Synthetic biology goes further, new protein can be created - for example, with the help of zinc finger, protein which can bind specific DNA sequences may be engineered – and new organisms can be created as performed by Craig Venter. GMOs can be regarded as a part of synthetic biology. The global undifferentiating made by the general public between GMOs and synthetic organisms can partially explain the reject of synthetic biology insofar as GMOs are unfortunately nearly only known for their massive use in agriculture (major application described in media). 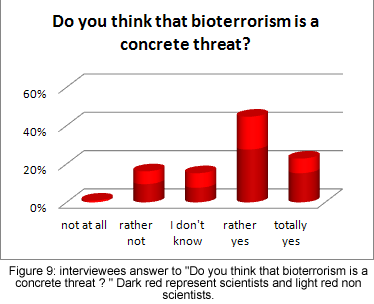 Bioterrorism seems to be a concrete threat for interviewees even if it is not a major one. 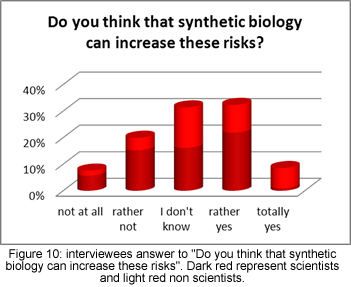 As illustrated in Figure 10, people majoritary think that synthetic biology can increase the bioterrorism threat. High-level technology multiplies the risks when it is used for bad purposes. Organisms used in bioterrorism can be improving thanks biosynthetic biology. However, their comments explained that it is the case for every scientific field. People can always misuse something. 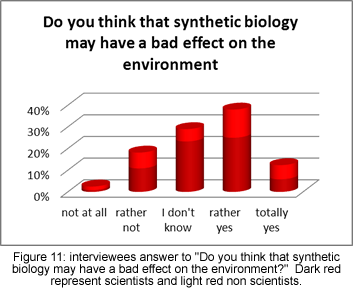 The figure 11 shows that the majority thinks that synthetic biology may have bad effects on the environment. This point has already been put into the light in comments from former questions. We do not know long term effects. Some people take care about biodiversity and have fear that these “super” organisms take the place of the other. For the majority, scientists need to pay attention to what they do. Even if interviewees think that the transfer of a gene of a synthetic species to a wild type one is possible, they do not have really fear. Some people think that synthetic species are just other ones. Other thinks that we have not enough experiment in long-term effect. So, prevention is required and researchers may continue to do efforts for keeping this technology in laboratories. Synthetic biology: the science of future? According to the figure 13, synthetic biology appears as the science of future. Even if there are some ethical risks and if most of people think that synthetic organism must stay in laboratories for avoid some problems, interviewees really trust in this new technology. Research would maybe bring answers concerning what is necessary for protect population against risks. According to the majority, research must continue and we can hope that it will lead to new and innovative solutions for solving world problems like starvation or finding new efficient medicines. 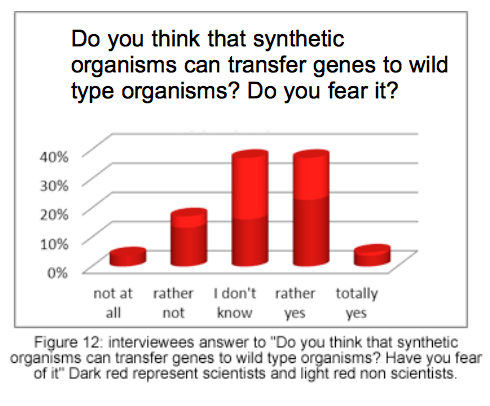 This survey enables to assess how people perceive synthetic biology. Whatever is the knowledge about synthetic biology, some relevant points concerning bioethic have been commonly raised, proving that bioethics is a general issue. The example of GMOs is formative. The general public has not been enough informed on GMOs and their possible useful applications (other than in agriculture), leading to a reject. If we want people to accept the future products of synthetic biology we have to open the discussion as soon as possible, making them taken part to the reflection on its applications. Learning about their fears and hopes will be but useful. The interest showed by the people we interviewed encourages us in this way. Biosafety and ethics are very important issues when a technology of any kind matures from the laboratory idea out to a product. Any new kind of technology can have a risk to the environment or the health of humans. Also public acceptance can decide the fate of the success of a technology. So careful consideration have to be done before during and after the project and the laboratory work. All team members who worked in the laboratory had safety courses concerning the handling of chemical and biological agents. And an additional lecture about laboratory safety was provided before the laboratory work had begun. As genes from arabidopsis thaliana and E.coli were just slightly altered to delete internal restriction sides, no safety issues were raised. Do any of our project ideas raise safety issues in terms of researcher safety, public safety, or environmental safety? None beyond the usual safety requirements as provided for a level one laboratory. Is there a local biosafety group, committee, or review board at our institution?  What does our local biosafety group think about your project? The group approved the ESBS iGEM project 2010. Do any of the new BioBrick parts that we made this year raise any safety issues? No. The key parts are the phytochrome B and the ClpXP protease of E.coli. The modification in the sequences just changed the internal restriction sides for AgeI, EcoRI and SpeI. This system is used to tightly control protein degradation of tagged proteins. This should allow a closer studying of gene dynamics and raises no safety issue.